When you train hard you need to protect your hands, the power gloves offer protection without bulk - with minimal padding, real bar feel. Measure the circumference of your flat hand just under the knuckles (not including your thumb). Our gloves are generally snug-fitting. The real leather is designed to stretch over the life of the glove. if you are inbetween sizes, we recommend you select the larger of the two sizes. if you prefer a looser fitting glove, buy one size larger than you typically wear. 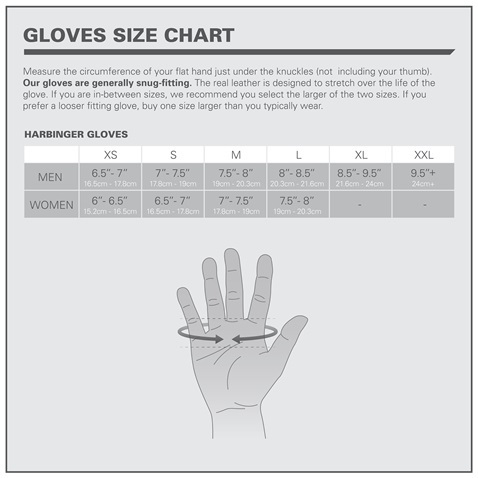 Harbinger Power Gloves is rated 3.3 out of 5 by 3. Rated 1 out of 5 by therealist from Disappointed Have been training for years and used a variety of gloves over that time. Previously had Harbinger mma gloves which had a great reputation, so when I needed some weight training gloves I thought I'd give them a try. After only 4 1/2 months one of the gloves has worn through the material and the leather has come away from the palm. Really poor quality! You pay more and you expect more, so I'm very disappointed that these gloves costing £13.99 have only lasted a short time. I've had gloves costing half this price in the past that have lasted far longer. Definitely won't be buying Harbinger again! Surprised Wiggle are selling such a poor product. Would certainly not recommend these gloves. Rated 4 out of 5 by clo87 from GOOD QUALITY Recently started weight training and have spent quite a bit of time looking for decent gloves to protect my hands, finally found them!!!! Excellent price and good quality can’t fault them, would highly recommend.